So you tried to upgrade your Windows machine to Windows 10 and it did not work. Got the cryptic error code 0x80070070 thrown at you, for instance when you check the Event Viewer, but have no idea what it means. A search on the Internet shows that other users experienced the same issue, but most of what is suggested is guesswork. Did you know that these error codes follow a specific pattern that you can easily decrypt? It is actually pretty easy provided that you know where to look for the information. Lets take 0x80070070 again and see where it takes us. The two important bits that you need to extract from the error code are the first number after the x, and the last four digits. The first number indicates the error code type. An 8 means it is a Win32 error code, a C means it is an NTSTATUS value. Once you know that, you simply look it up either on the Win32 error code page in the case of a Win32 error, or on the NTSTATUS page instead. Since the example error code refers to a Win32 error code, you would look it up on the Win32 error code page. 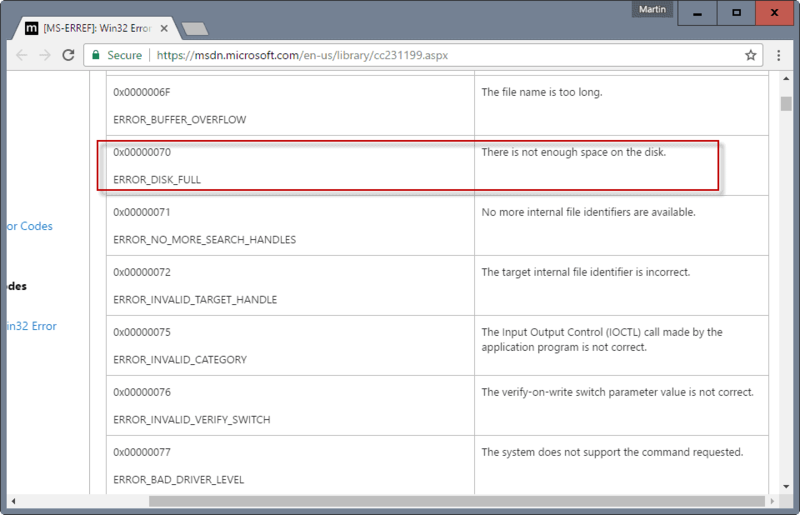 There you would find listed 0070 which indicates a disk space error. Check the first number after the 0x to find out whether it is a Win32 or NTSTATUS error. Consult the error code page that resulted from 1, and look up the last four digits on the page to find out what the error code means. The error type is listed on the page, and a description that is often more useful as it provides you with additional information. Not all error codes or descriptions are easy to understand though, and you may not know what you need to do to resolve it after identifying the error correctly. While error codes like 0003 path not found or 004 access denied may point you in the right direction, codes like 00D7 nesting not allowed or 00D1 the signal number is invalid may not. Still, knowing what an error code means can provide you with valuable information on where to look for help. Even if you cannot figure it out on your own, you may provide others with the additional details as they may have a fix for that issue. Obviously, this won't help you if a patch or update is borked and needs updating by Microsoft first. In case you are wondering, the information come from a detailed article on Microsoft's IT Pro website over on Technet that explains how to resolve Windows 10 Upgrade Errors. It is a good read and well worth a bookmark; while designed for Windows 10, it may prove useful for previous versions of Windows as well. There is a list of common errors, explanations, and mitigation instructions. This includes error codes 0xC1900101, and various 0x800xxxxx error codes which can be really useful especially when upgrading a system to Windows 10. In case you are interested in generic Windows Update error codes and their meaning, check out this resource page on the Microsoft website instead. Now You: How do you handle Windows update or upgrade errors? Find out how to decrypt Windows upgrade (and update) error codes when you run into them when you try to install updates. Martin, error codes have flummoxed me for years. Now you have published a comprehensive list of error codes, where to find them and how to interpret them. As they are from MS technical articles, I am surprised that MS does not publicize the lists without waiting for someone like you to ferret them out. Now that everyone can interpret the errors ( well, people who read your blog ), it will save a huge amount of time in trouble shooting borked PCs / Laptops. Yet again, thank you ! @Martin: Sorry for posting here (feel free to delete this comment), but I wanted to make sure you got the email that I sent you a few days ago. I’m afraid it may have gone to spam. The apparent fact that M$ does not provide a utility + database to parse and decode these codes into English (or another language) shows the depth of their arrogance culture. An end user or most application programmers should not have to put up with this incomprehensibility! Q: How do you handle Windows update or upgrade errors? A: The below sub-playlist@ https://www.youtube.com/playlist?list=PLHUXny-R7cAkURHpdaEWv2gnecBU5Zigx contains solutions to the most common errors that could frequently pop-up on computer system. Does anyone have a similar list for BSOD (Blue Screen of Death) error codes? Damn, I hate to defend msoft, but, notice the “msdn” in the Address line of the first pic. That’s MicroSoft Developer Network. The error codes and descriptions have always been there for every iteration of windows since there was an msdn online presence. Before that they were in a 10″ high tower of books one had to buy. A programmer does not have to write a lot of the basic stuff, they just call windows routines from the OS to do the work when they want a message box to display for instance. The error codes make sens if you understand Binary. Stay calm and polish that tinfoil hat for something else.